Recent release “Fallacy” from Page Publishing author L.K. Crowson is a riveting story introducing Rachel, a widowed mother with a grown dependent child inexplicably attacked while standing in her front yard, and Jason, the detective assigned to her case. Their connection blossoms into something more than professional, possibly putting his investigative objectivity at risk in the hunt for Rachel’s assailant. L.K. Crowson, a mother and grandmother who has lived with her husband of forty-six years and her youngest son, a charming young man with Down Syndrome, in Washington State, has completed her book “Fallacy”: an engrossing romantic drama. Rachel survives being shot in her front yard. Someone is trying to kill her, but why? Can Detective Devereux keep her safe and catch the person trying to kill her at every turn? A widow with three adult children, just living a simple life, nothing to draw a killer. Something about this woman pulls Jason Devereux to uncharacteristically make her protection personal. Their attraction to each other may be a hindrance to her safety. Jake, her Down syndrome son, wants to protect his mother. Can he help save her life? Published by New York City-based Page Publishing, L.K. Crowson’s book is a gripping novel that starts with an unprovoked attack and grows into a life-changing romantic adventure. 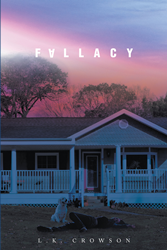 Readers who wish to experience this engaging work can purchase “Fallacy” at bookstores everywhere, or online at the Apple iTunes store, Amazon, Google Play, or Barnes and Noble. Page Publishing is a traditional New York-based, full-service publishing house that handles all the intricacies involved in publishing its authors’ books, including distribution in the world’s largest retail outlets and royalty generation. Page Publishing knows that authors need to be free to create - not overwhelmed with logistics like eBook conversion, establishing wholesale accounts, insurance, shipping, taxes, and the like. Its roster of accomplished authors and publishing professionals allows writers to leave behind these complex and time-consuming issues to focus on their passion: writing and creating. Learn more at http://www.pagepublishing.com.